The high-voltage wiring is available many places, like Digi-Key. Here is one option. It isn’t just the wiring, but the splices must contain the voltage. Things like multiple layers of adhesive shrink tubing, or other methods must be used for proper termination. I know nothing about this other than it looks cool and scares me but was looking at this the other day. Just in case there is any info here that you can use, he includes links to what he used. Is it really 12,000 volts?? Yikes!! 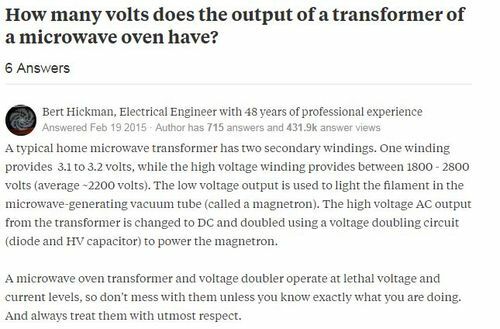 Everything I read said that even with the voltage doubler it’s no more than 5K volts as mentioned here. 12KV is common for neon sign transformers. A good wire is solid core spark plug wires. Oops. Sorry. I missed that tid bit. Electric fence hook up wire is rated for 20kv. If I was doing this I’d wear class 2 voltage gloves. Interesting project—but having been zapped by a motor capacitor once many years ago, I have a healthy respect for and want nothing to do with that now! Read the label on the wire itself for its rated voltage – seems an electrician would know that. Neon light transformers go as high as 200kv albeit at a miniscule current, what does the wire you’re using say? Wire is a catalog item go to any major electrical suppliers web site and spec out what you need. I went to mouser.com and looked up high voltage wire and they have stock wires to 60kv. What does the data plate on the transformer say?